The American Association of Critical-Care Nurses (AACN) in Aliso Viejo, California, recently conferred a bronze-level Beacon Award for Excellence on Indian River Medical Center. 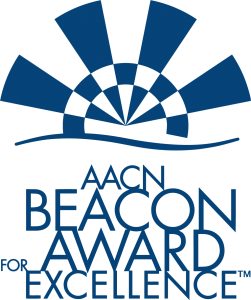 The Beacon Award for Excellence — a significant milestone on the path to exceptional patient care and healthy work environments — recognizes unit caregivers who successfully improve patient outcomes and align practices with AACN’s six Healthy Work Environment Standards. Units that earn this three-year, three-level award with a gold, silver or bronze designation meet national criteria consistent with Magnet Recognition, the Malcolm Baldrige National Quality Award and the National Quality Healthcare Award. AACN President Christine Schulman, MS, RN, CNS, CCRN-K, applauds the commitment of the caregivers at IRMC for working together to meet and exceed the high standards set forth by the Beacon Award for Excellence. These dedicated healthcare professionals join other members of our exceptional community of nurses, who set the standard for optimal patient care. The other Beacon Award designations are gold and silver. Gold-level awardees demonstrate an effective and systematic approach to policies, procedures and processes that include engagement of staff and key stakeholders; fact-based evaluation strategies for continuous process improvement; and performance measures that meet or exceed relevant benchmarks. Recipients who earn a silver-level award demonstrate an effective approach to policies, procedures and processes that includes engagement of staff and key stakeholders; evaluation and improvement strategies; and good performance measures when compared to relevant benchmarks. AACN honors IRMC and other Beacon Award for Excellence recipients with announcements in AACN Bold Voices, the monthly award-winning member magazine distributed to more than 100,000 acute and critical care nurses nationwide. AACN also honors awardees at the National Teaching Institute & Critical Care Exposition, the world’s largest educational conference and trade show for nurses who care for acutely and critically ill patients and their families.